The Director of Property Management oversees and manages the daily operations and maintenance of various properties. Even though the type of property held may differ from company to company, the major tasks listed in the Director of Property Management resume include – guiding and supervising property managers team, resolving conflicts between property manager and tenants, approving budgets and expenditures, maintaining and keeping track of tenant documents and files, assessing overall maintenance and condition of properties, conducting strategic planning and determining relative profit from the property. The essential skills to be possessed by candidates aspiring for this job are – property management expertise, full understanding of property management and its rules and regulations, competency in related software, customer focus and excellent time management skills. 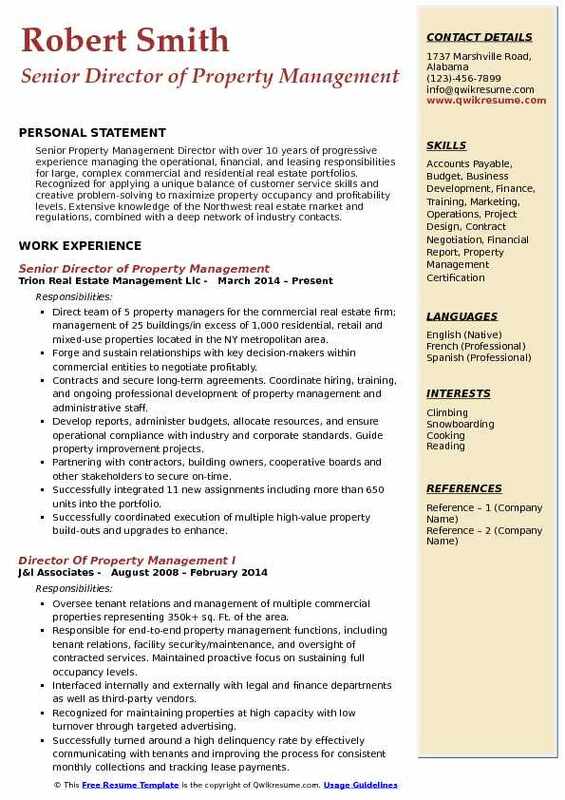 A bachelor’s degree in the field of property management or business or finance is required for this position. Headline : A motivated leader with a strong focus on marketing, collections, and controlling expenses. Diplomatic and tactful with customers, co-workers, and supervisors. Exceptional customer service skills. Accustomed to handling sensitive, confidential records. Demonstrated history of producing accurate, timely reports. Exceptional trainer, coach, and captain. Flexible and versatile - able to maintain a sense of humor under pressure. 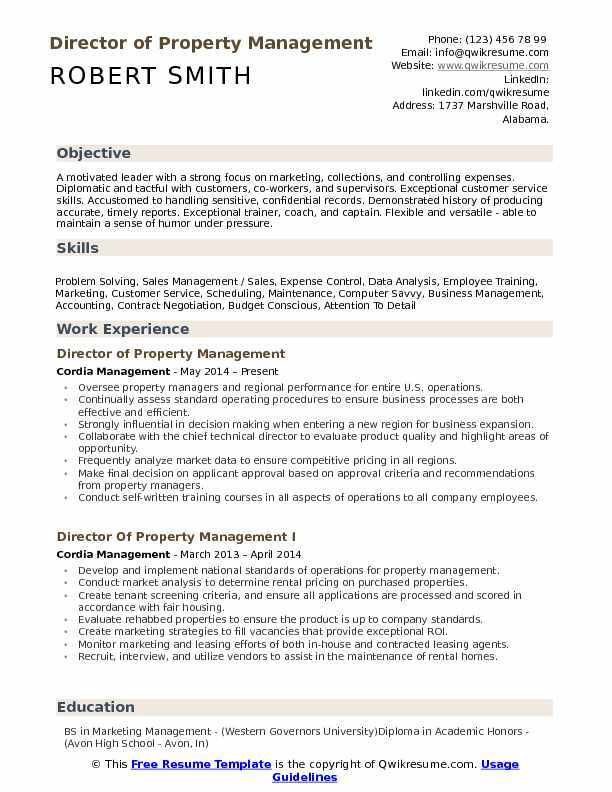 Oversee property managers and regional performance for entire U.S. operations. Continually assess standard operating procedures to ensure business processes are both effective and efficient. Strongly influential in decision making when entering a new region for business expansion. Collaborate with the chief technical director to evaluate product quality and highlight areas of opportunity. Frequently analyze market data to ensure competitive pricing in all regions. Make final decision on applicant approval based on approval criteria and recommendations from property managers. Conduct self-written training courses in all aspects of operations to all company employees. Oversee activities of marketing manager to continually evaluate marketing messages and strategies. Create sales goals for leasing agents and track performance successes and opportunities. 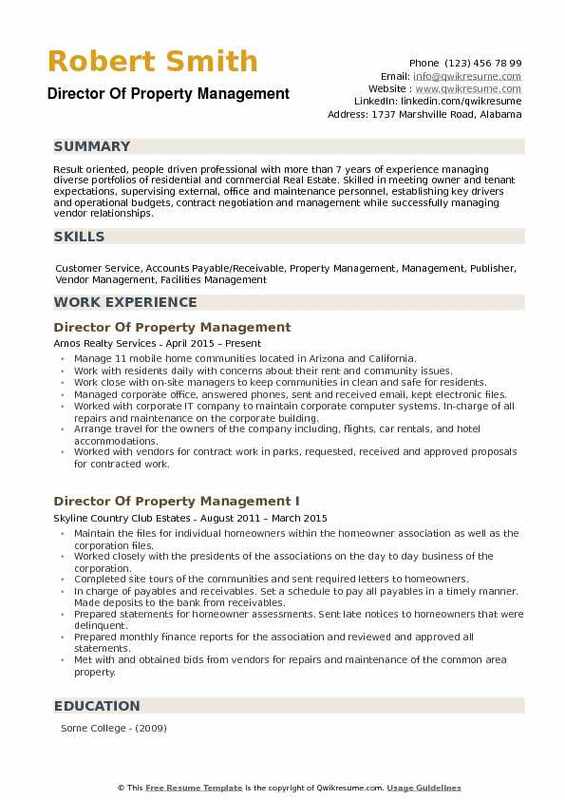 Headline : To secure a challenging position in the area of property or construction management that utilizes my excellent organizational, operational, financial planning, marketing and people management skills which allows the opportunity to interact with all levels of professionals while representing the company on site and in the field. Provides management, direction, and leadership to ensure the properties in the portfolio group are operated in accordance with company objectives. Oversee property management strategic direction and operational performance of properties. Responsible for compliance with company guidelines and management operations as it relates to specific procedures listed herein. Ensure compliance with all rules, regulations, and laws relevant to fair housing practices. Develop and implement policies on building operations and maintenance. Monitor occupancy, rent collection and cost control to ensure the financial stability of properties. Manage tenant relationships and address any issues regarding services, products, and/or personnel. Collaborate with and advise company owners on all property level activities and issues. Provide training for staff as new hires or opportunities for advancement. Headline : A successful career in property management. Focused and highly motivated with proven strengths in increasing revenues and profitability. Increased occupancy levels accomplished by building strong tenant and community relations. Ability to communicate effectively with all strata of the business environment from corporate to tenant dispute resolution. Management philosophy emphasizes team building skills and accountability. Oversee and manage the operations and buildouts of a diverse portfolio of industrial and commercial office space. Arrange and lead tours of new and existing space for prospective tenants. Handle multiple projects simultaneously in an extremely professional manner. Conduct quarterly inspections of the properties and tenant spaces to ensure compliance with leases and proper upkeep of the property. Create work orders for tenants to log and address any issues within their leased space. Monitor and maintain the exterior and common areas of the properties to ensure they comply with the company standard. Compile a 10-year plan for all major building and mechanical systems so that there is an estimated timeline of when these systems will need to be replaced and budgeted for. Invoice tenants monthly for rent due and ensure timely payment. Issue default letters as needed for tenants that do not follow the guidelines set forth in their lease. Code and submit all invoices related to the properties for payment. Review all invoices to ensure that the amounts and services provided are accurate. 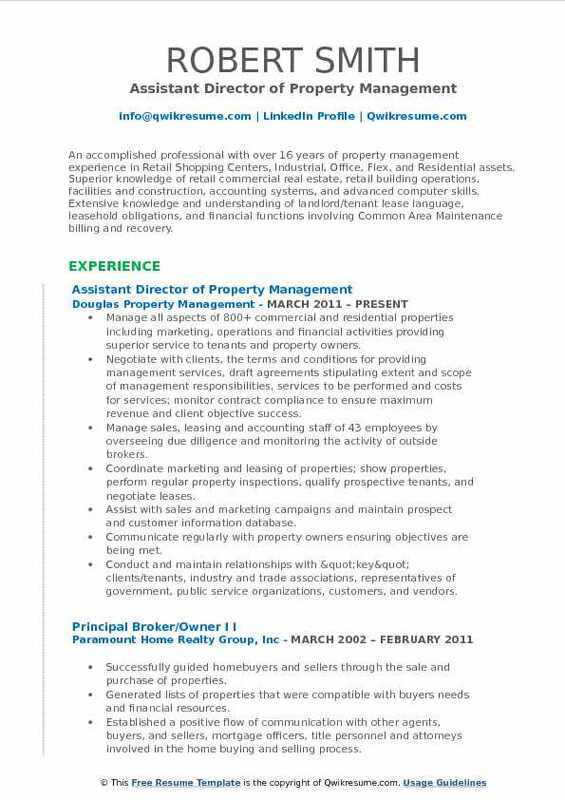 Summary : An accomplished professional with over 16 years of property management experience in Retail Shopping Centers, Industrial, Office, Flex, and Residential assets. 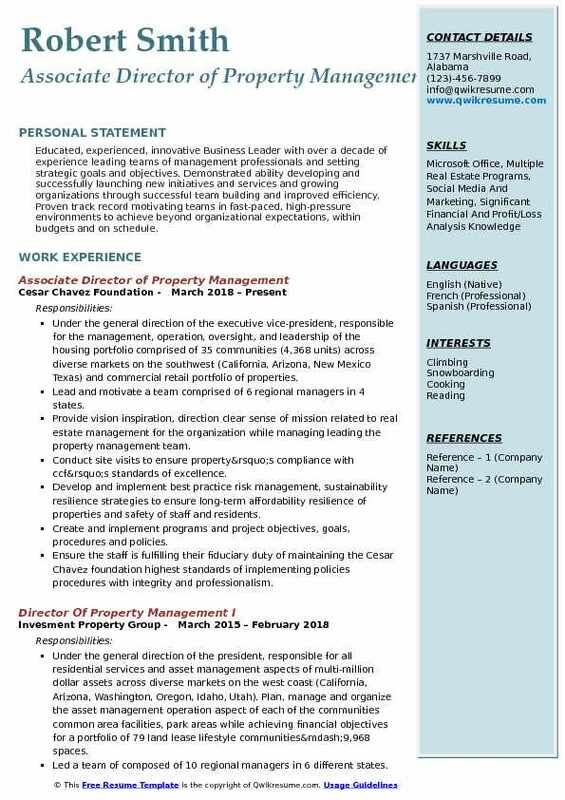 Superior knowledge of retail commercial real estate, retail building operations, facilities and construction, accounting systems, and advanced computer skills. Extensive knowledge and understanding of landlord/tenant lease language, leasehold obligations, and financial functions involving Common Area Maintenance billing and recovery. Manage all aspects of 800+ commercial and residential properties including marketing, operations and financial activities providing superior service to tenants and property owners. Negotiate with clients, the terms and conditions for providing management services, draft agreements stipulating extent and scope of management responsibilities, services to be performed and costs for services; monitor contract compliance to ensure maximum revenue and client objective success. Manage sales, leasing and accounting staff of 43 employees by overseeing due diligence and monitoring the activity of outside brokers. Coordinate marketing and leasing of properties; show properties, perform regular property inspections, qualify prospective tenants, and negotiate leases. Assist with sales and marketing campaigns and maintain prospect and customer information database. Communicate regularly with property owners ensuring objectives are being met. Conduct and maintain relationships with "key" clients/tenants, industry and trade associations, representatives of government, public service organizations, customers, and vendors. Train and develop staff, provide coaching, conduct appraisals, and make hiring decisions; address complaints and resolve issues with the assistance of the president and/or legal department if necessary. Successfully define workflows, responsibilities, and reporting relationships. Objective : Educated, experienced, innovative Business Leader with over a decade of experience leading teams of management professionals and setting strategic goals and objectives. Demonstrated ability developing and successfully launching new initiatives and services and growing organizations through successful team building and improved efficiency. Proven track record motivating teams in fast-paced, high-pressure environments to achieve beyond organizational expectations, within budgets and on schedule. Under the general direction of the executive vice-president, responsible for the management, operation, oversight, and leadership of the housing portfolio comprised of 35 communities (4,368 units) across diverse markets on the southwest (California, Arizona, New Mexico Texas) and commercial retail portfolio of properties. Lead and motivate a team comprised of 6 regional managers in 4 states. Provide vision inspiration, direction clear sense of mission related to real estate management for the organization while managing leading the property management team. Conduct site visits to ensure property’s compliance with ccf’s standards of excellence. Develop and implement best practice risk management, sustainability resilience strategies to ensure long-term affordability resilience of properties and safety of staff and residents. Create and implement programs and project objectives, goals, procedures and policies. Ensure the staff is fulfilling their fiduciary duty of maintaining the Cesar Chavez foundation highest standards of implementing policies procedures with integrity and professionalism. Review monthly arrears; rent collection, vacancy, and apartment vacancy/make ready reports for each property to ensure effective management of assets and collection of maximum rental potential. Ensure the financial and physical health, including compliance with the regulatory, insurance, lender and syndicator requirements, of all of ccf’s real estate assets. 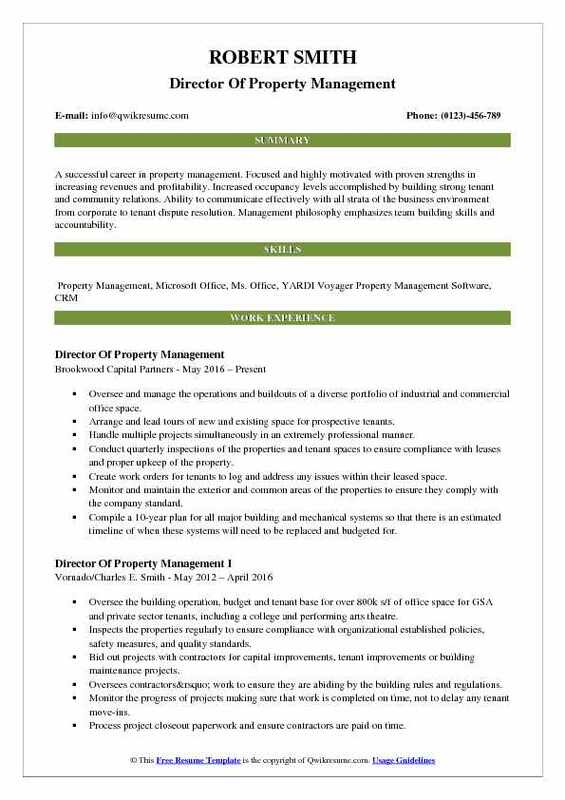 Objective : A dynamic, resourceful professional with extensive experience in commercial property management, focusing on high-rise office buildings, retail and multi-family units. A visionary leader and motivator who excels in teaching, training and empowering employees. Proven track record of developing high-performance teams of diverse personnel in the professional realm as well as the non-profit volunteer arena. Meet with prospective tenants to show properties, explain the terms of occupancy, and provide information about local areas. Direct collection of monthly assessments, rental fees, and deposits and payment of insurance premiums. Inspect grounds, facilities, and equipment routinely to determine the necessity of repairs or maintenance. Investigate complaints, disturbances, and violations and resolve problems following management rules and regulations. Plan, schedule, and coordinate general maintenance, major repairs, and remodeling or construction projects for commercial or residential properties. Manage and oversee operations, maintenance, administration, and improvement of commercial, industrial, or residential properties. Maintain records of sales, rental or usage activity, special permits issued, maintenance and operating costs, or property availability. Direct and coordinate the activities of staff and contract personnel and evaluate their performance. Maintain contact with insurance carriers, fire and police departments, and other agencies to ensure market vacant space to prospective tenants through leasing agents, advertising, or other methods. 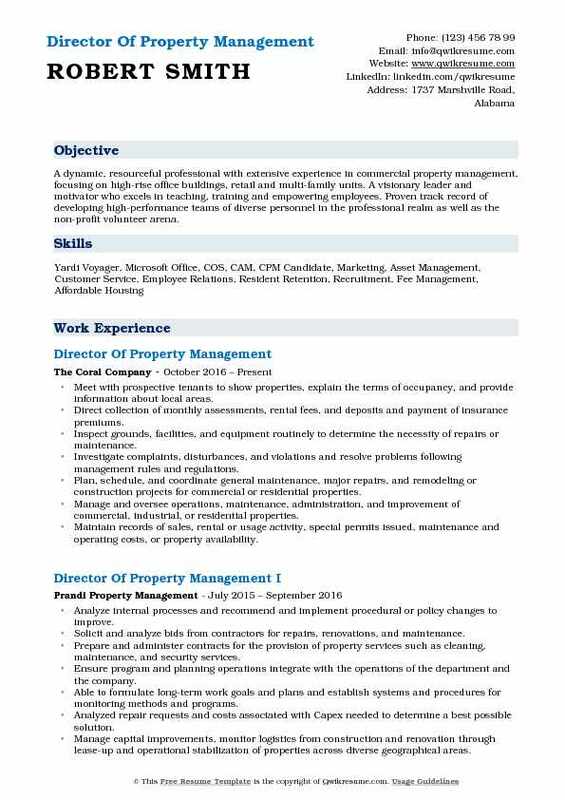 Summary : Seasoned portfolio property manager with 15 years of experience in the residential and mixed use property management field. Outstanding leadership skills in challenging environments. Unsurpassed communication and organizational skills combined with a wealth of knowledge in successfully completing large scale building projects, financial planning and insurance claim losses. Accompanied by a wide range of industry related partners with whom a trusted and balanced relationship has been fostered. Supervise a team of 13 in the daily operations and facility maintenance of 13 properties and 345 units. Establish, analyze and maintain department and property budgets regularly to ensure positive cash flow. Negotiate new contracts to reduce cost and improve performance, and implement new services to raise revenue annually. Work with subcontractors and vendors to ensure successful completion of projects by scope, budget, and schedule. Collaborate with multiple departments and subcontractors to complete rehab and turnover projects within established deadlines and budgets. Review and audit purchase orders, subcontractor invoices, inspection reports, facility reports and annual reports for compliance. Protect the company from financial losses during legal disputes with preventative measures, negotiation and/or representation. Balance the needs of clients through excellent service while complying with the company’s guidelines. Motivate, encourage and coach staff with proper feedback and teamwork efforts. 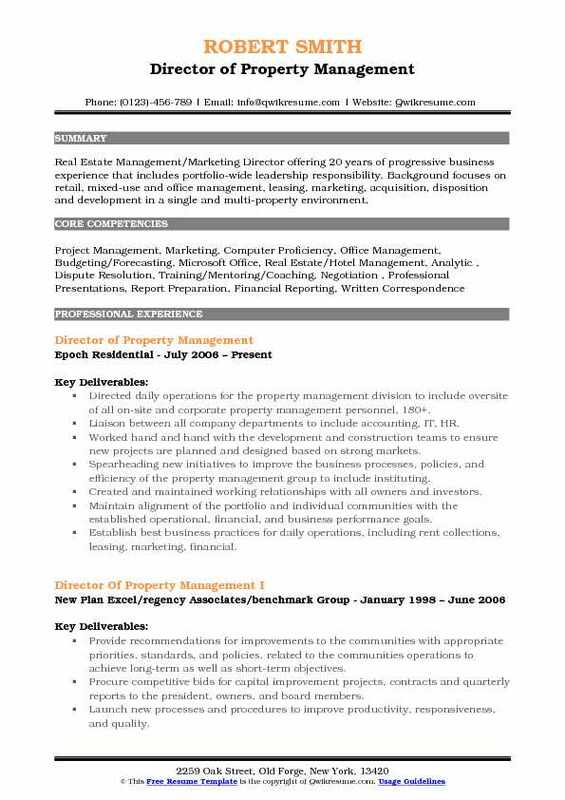 Summary : Real Estate Management/Marketing Director offering 20 years of progressive business experience that includes portfolio-wide leadership responsibility. Background focuses on retail, mixed-use and office management, leasing, marketing, acquisition, disposition and development in a single and multi-property environment. Directed daily operations for the property management division to include oversite of all on-site and corporate property management personnel, 180+. Liaison between all company departments to include accounting, IT, HR. Worked hand and hand with the development and construction teams to ensure new projects are planned and designed based on strong markets. Spearheading new initiatives to improve the business processes, policies, and efficiency of the property management group to include instituting. Created and maintained working relationships with all owners and investors. Maintain alignment of the portfolio and individual communities with the established operational, financial, and business performance goals. Establish best business practices for daily operations, including rent collections, leasing, marketing, financial. Works closely with the real estate development division to develop new property management plans for new properties. 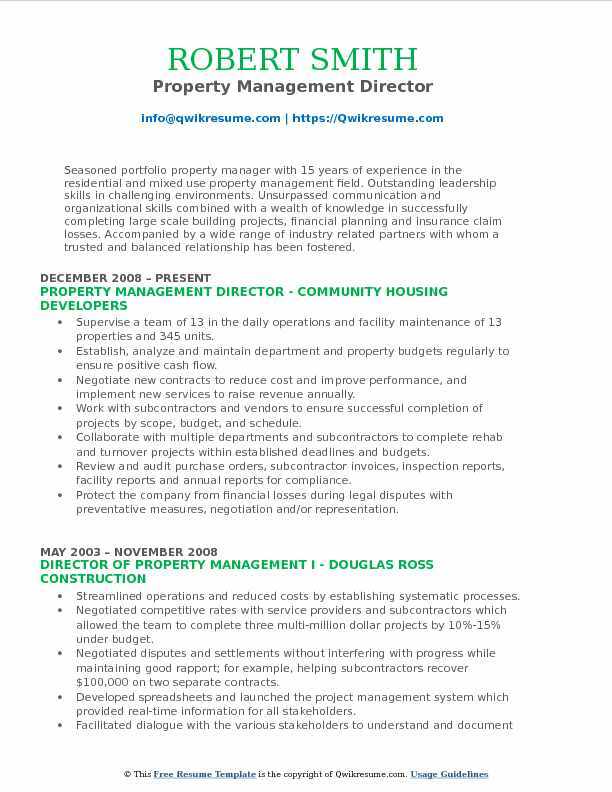 Summary : Senior Property Management Director with over 10 years of progressive experience managing the operational, financial, and leasing responsibilities for large, complex commercial and residential real estate portfolios. Recognized for applying a unique balance of customer service skills and creative problem-solving to maximize property occupancy and profitability levels. Extensive knowledge of the Northwest real estate market and regulations, combined with a deep network of industry contacts. Direct team of 5 property managers for the commercial real estate firm; management of 25 buildings/in excess of 1,000 residential, retail and mixed-use properties located in the NY metropolitan area. Forge and sustain relationships with key decision-makers within commercial entities to negotiate profitably. Contracts and secure long-term agreements. 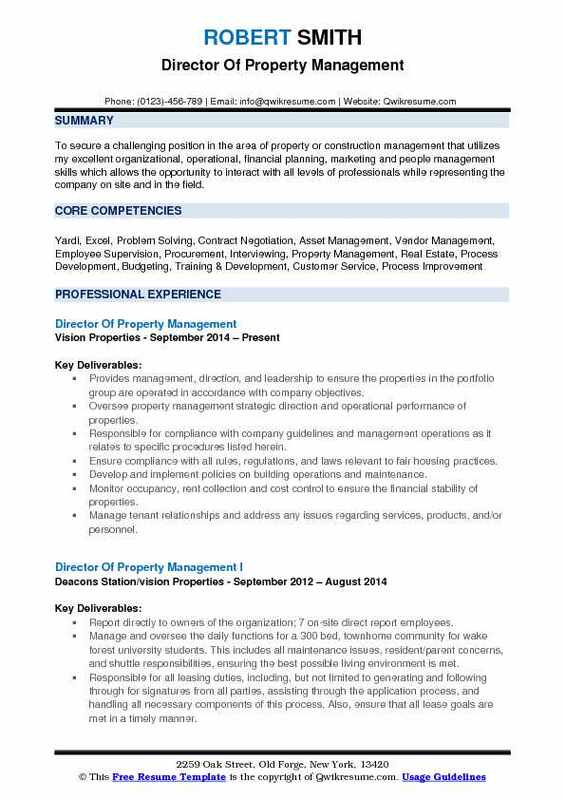 Coordinate hiring, training, and ongoing professional development of property management and administrative staff. Develop reports, administer budgets, allocate resources, and ensure operational compliance with industry and corporate standards. Guide property improvement projects. Partnering with contractors, building owners, cooperative boards and other stakeholders to secure on-time. Successfully integrated 11 new assignments including more than 650 units into the portfolio. Successfully coordinated execution of multiple high-value property build-outs and upgrades to enhance. Establish protocols for property management procedures and standard practices; work with existing. Procure 3rd party energy providers and shop market for preferred bulk rates on entire portfolio resulting. Summary : Result oriented, people driven professional with more than 7 years of experience managing diverse portfolios of residential and commercial Real Estate. Skilled in meeting owner and tenant expectations, supervising external, office and maintenance personnel, establishing key drivers and operational budgets, contract negotiation and management while successfully managing vendor relationships. Manage 11 mobile home communities located in Arizona and California. Work with residents daily with concerns about their rent and community issues. Work close with on-site managers to keep communities in clean and safe for residents. Managed corporate office, answered phones, sent and received email, kept electronic files. Worked with corporate IT company to maintain corporate computer systems. In-charge of all repairs and maintenance on the corporate building. Arrange travel for the owners of the company including, flights, car rentals, and hotel accommodations. Worked with vendors for contract work in parks, requested, received and approved proposals for contracted work. In charge of ensuring that all vendor required insurance documents were received and up to date. Worked with local mobile home dealers to find used homes to fill vacant spaces in communities.